Dodgers catcher A.J. Ellis said Ryu was debuting a new curveball grip he worked on all spring. And, indeed, PITCHf/x data tracked on BrooksBaseball.net measured Ryu’s curveball as having nearly twice as much vertical movement Sunday night as compared to his two playoff outings last October. “It was the sharpest curveball I’ve seen him throw in the last year and two starts,” Ellis said. 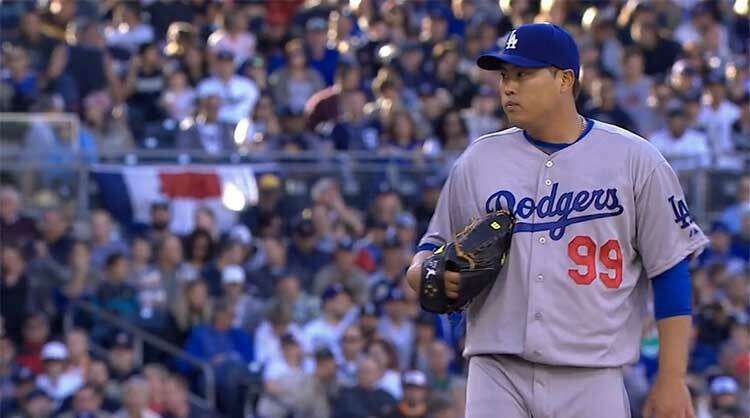 Ryu threw 13 curves last night, and it’s easy to show that the Padres did nothing with them. Four were balls, four were called strikes, two were fouls, two were swinging strikes — including a punch-out of Chase Headley — and one was a Chris Denorfia groundout. Let’s look at the Headley whiff. LOOK AT IT. It’s glorious. It’s admittedly difficult to see release point differences in GIFs, so I won’t pretend that I do. But what does seem clear is both that the Blanco pitch doesn’t dive as much, and also that it started higher, as it went only to Blanco’s belt, as opposed to below Headley’s knees. 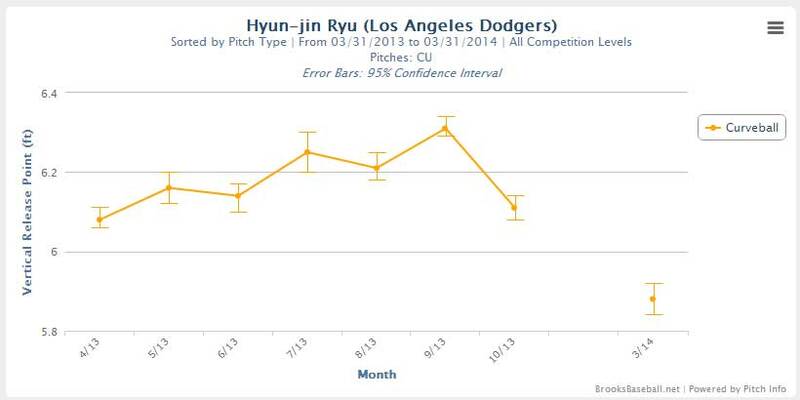 There’s also this: Ryu’s curveball wasn’t really a weapon for him last year. He threw it 295 times, and it got hit hard, to the tune of a .307/.325/.480 line against. And yet, he was still 17th overall in FIP. He was still 14th, tied with Stephen Strasburg, in ERA, and 25th, tied with Justin Verlander, in RA9-WAR. On a team where he wasn’t overshadowed by Clayton Kershaw and Zack Greinke (and Yasiel Puig, and Matt Kemp, and Hanley Ramirez, and…) he might have been viewed as an ace. By some measures, he already was, and now he’s got a fancy new toy and 12 scoreless innings to start the season. I would have taken a repeat of last year and been perfectly happy with that, honestly. If there’s now some hope that he can be even better, well, that’s just not fair.